Childhood Obesity due to poor diet and lack of exercise is a huge issue in our country. So much so that First Lady Michelle Obama created the Let’s Move! campaign to change the way kids think about food and nutrition and to get them excited about living healthy. Physical activity is an essential component of a healthy lifestyle. In combination with healthy eating, physical activity helps control weight, builds lean muscle, reduces fat, promotes strong bone, muscle and joint development, and decreases the risk of obesity and other life threatening diseases. Children need 60 minutes of play with moderate to vigorous activity every day to grow up to a healthy weight. 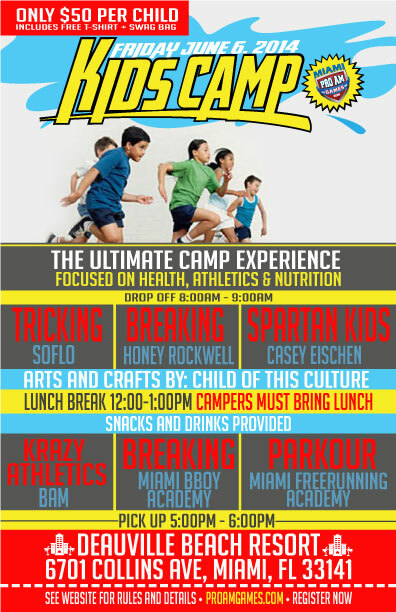 This summer camp will show kids new fun and exciting ways to exercise, be creative and live healthy. With counselors teaching Martial Arts, Break Dancing, Tricking, Dancing, Art, Nutrition and much more, kids age 5-13 will get expert instruction in a wide variety of positive and fun activities.